HomeHow Effective is Earth Day? How Effective is Earth Day? In 1970, Senator Gaylord Nelson initiated the world’s first Earth Day, an effort to convince the U.S. government that our planet was in danger. Right off the bat, those initial rallies convinced 25% of Americans of the importance of protecting the environment — up from just 1% the year before. Over the next decade, the Environmental Protection Agency was established and significant earth-friendly legislation was passed, including the Clean Air Act, the Endangered Species Act, and the Water Quality Improvement Act. Earth Day celebrations have grown and expanded, eventually becoming an international movement. 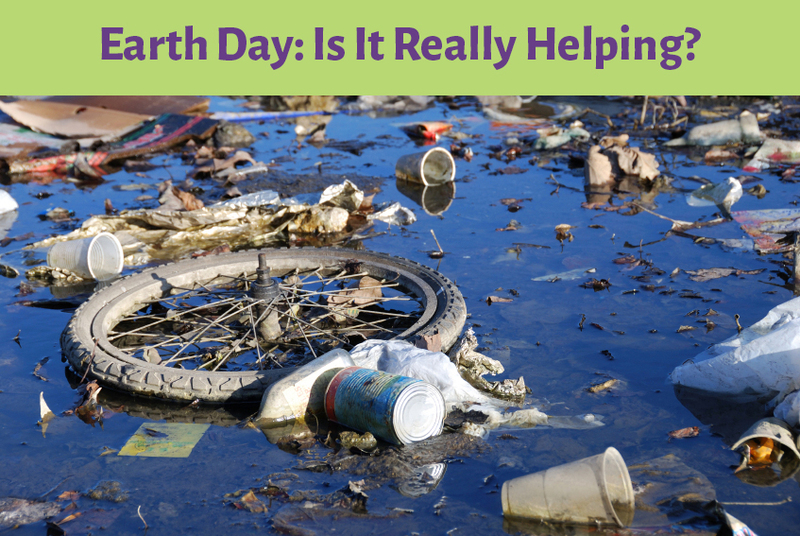 Now, Earth Day is celebrated in nearly 200 countries across the globe, and has become “the largest secular civic event in the world.” But still, are we making a difference? In 2013, the Huffington Post and YouGov set out to assess Americans’ eco-friendly attitudes and actions with a poll repeating questions originally asked in 1971, when Earth Day was still new. The results were mixed. More Americans are eating organic now, and many more are recycling cans, bottles, newspapers, and magazines — 79% compared to fewer than 26% who recycled in 1971. Twice as many of us have stopped using disposable paper and plastic goods than in the 70’s, but 84% of us still rely on these products. 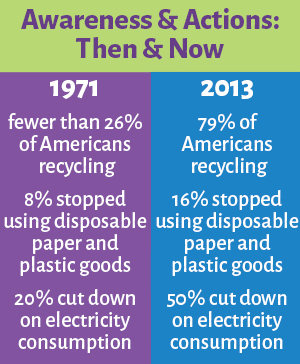 Half of Americans have cut down on electricity consumption, versus only 20% back in 1971. However, there was no change in the number of people who cut down on car use, chemical pesticides, and high-phosphate cleaning products. And far fewer Americans today view improving the environment as a priority and fewer believe we should dedicate more federal funds to environmental programs. Walk or bike instead of driving. Carpool if possible, and consolidate your car trips to save on gas. Eat less meat to cut greenhouse gas emissions. Check out some of our vegan supplements to support your planet-friendly diet. Reduce the amount of junk mail you receive with these tips from the EPA. Plant something — a tree, a plant, flowers, or a veggie garden. Stop adding plastic bags to the landfill. Switch to reusable shopping bags. Grab a couple of trash bags and some friends and go on a litter-collecting walk to clean up your neighborhood. Contact your senators and representatives to encourage them to include environmental education in the 2015 budget. You would think past teaches us anything, but alas. Hate all you want but the world changes, and we have no control whatsoever over it. For instance, imagine Barack had enough balls to put Putin to his place, but it seems like it’s not happening, welcome world war.